AQURON 2000 Concrete Sealer for stopping ingress into concrete in aged care. Original Research led to the discovery of a radical catalyst working in colloidal silicates which gives AQURON solution the unique action of being drawn deeply into the cementitious matrix utilising internal “free moisture” and alkaline components of the concrete to make an extensive impermeable hydrogels inside the concrete. By forming a hydrogel throughout the concrete, AQURON becomes an integral part of concrete, and provides permanent internal concrete sealer properties and resistance to surface damage from abrasion and corrosives. AQURON Solutions are 100% VOC free water-borne solutions, and are the desirable choice for building environmentally sensitive structures. 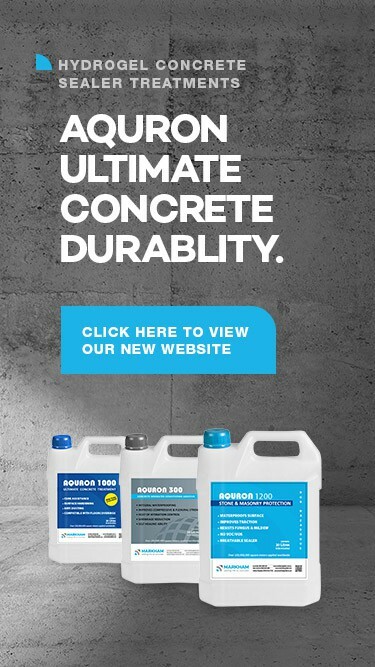 AQURON’s concrete sealer performance has been proven since 1984, on over 100,000,000m2 of concrete worldwide.